Mentions are the results of your online listening search projects. The system finds each usage of your keyword and collects it for you in your SentiOne panel with additional information. To get relevant mentions (e.g. from chosen source or time period) you can sort your results in the Mentions module. It allows you to browse and filter results collected within a specific project. Start working in Mentions module by choosing one of your projects. Click the panel to see the list of your projects. Results sorting – allows to filter mentions by publication date, indexation in the SentiOne system, or the reach of statements. 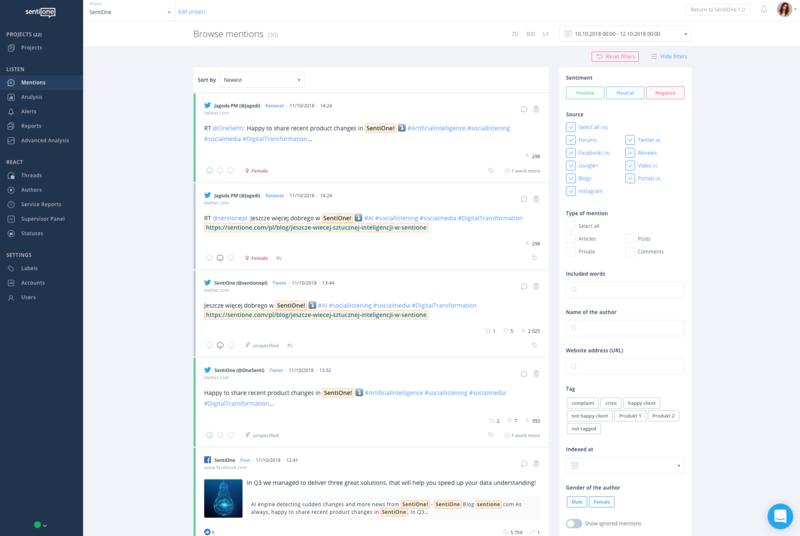 You can sort mentions increasingly or decreasingly within each of these categories. Additional options – ticking this option determines if ignored statements are displayed in the list of mentions. Date of statement publication on the Internet. Link to the source of a statement. It can be Facebook (comment or post), microblog (like Twitter), Instagram, YouTube, Google+, Wykop, blog, forum, portal. Post type – post, comment, review, retweet, or video. Reply functionality – available only for users with access to SentiOne React features. By clicking the button the user is moved to the Threads module where they can reply to a given statement straight from the tool. Ignore – option to ignore chosen statements. Ignored statements can be included or excluded in displayed mentions by using the proper filter. Information regarding number of followers – data placed here depends on the type of source: Facebook (number of shares, likes, comments), Twitter (number of people observing account, likes, retweets), YouTube (number of likes, dislikes, displays), Instagram (number of likes, comments), Wykop (number of likes or shares, comments). Influence Score - helps you to discover statements, authors, and sites that are the most popular and influential. In Dashboards users can also export graphs from widgets into images in PNG,SVG, and JPG formats or into XLS, CSV. This feature can be useful for customers who would like to create or customize their own charts or copy charts into presentations. Data exporting options are also important for customers that use external software i.e. to analyze text.